Celebrating 50th anniversary of married life is really awesome. It’s a great achievement for the couple who is going to celebrate their happy 50th anniversary. 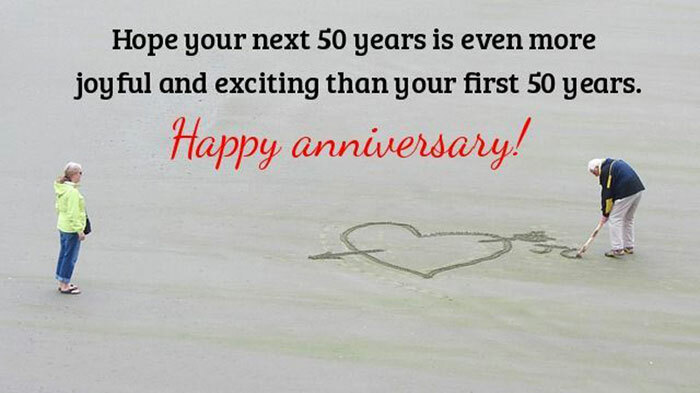 If you want to wish a couple on their happy occasion of 50th anniversary then you may use these 50th Anniversary Wishes and greeting messages. 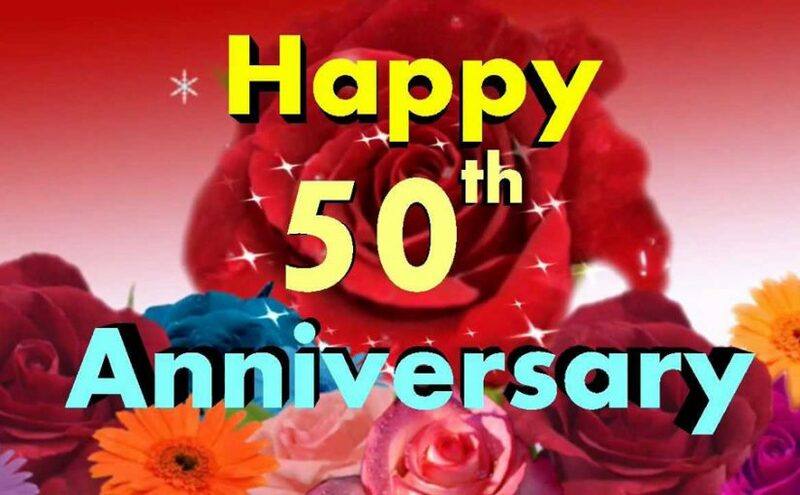 Here we decorated this post by the best 50th anniversary wishes, messages and quotes to wish your close ones a very happy golden jubilee or happy 50th wedding anniversary. Read carefully to choose the best and make your wish perfect! As you reflect back on the 50 years of your marriage, may every memory bring a smile to your faces and strength for another 50 years together. Happy golden Anniversary! That magical number 50, Is special through and through, It shows the love and commitment, That shines Golden for both of you. 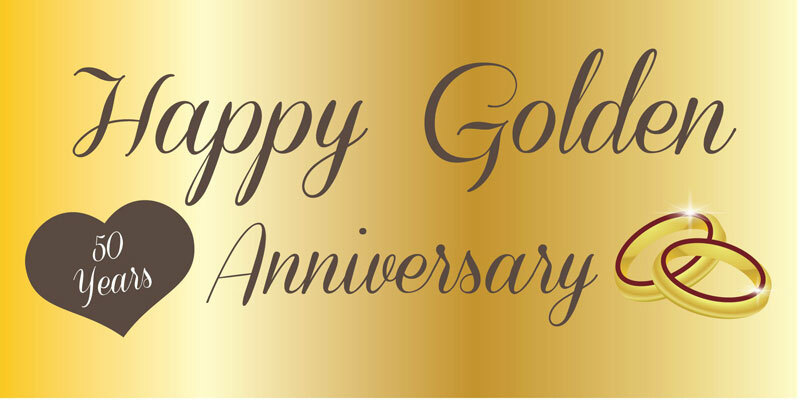 We wish you a Happy Golden Anniversary! It takes 50 years to turn marriage into gold, Wish you maintain this warmth and never turn cold!! Happy wedding anniversary! 50 years and still together that alone is a great achievement, you love each other like your just one the golden year is here but many more to come. Happy 50th Anniversary. Fifty golden years together filled with sharing, love and trust a few upsets along the way but these ingredients are a must, Congratulations! Today your marriage has completed half century, With all the love and sanctity! Happy wedding anniversary!!! Golden wishes come your way on this your Golden Wedding Anniversary enjoy your party with family and friends have a wonderful Day! I remember how young, beautiful and happy you were when I was a little kid. And you know, dear parents, nothing has changed since then. You’re just the same: loving and being loved – that’s what important. Congratulations on your wedding anniversary! Mom and Dad, you both are an inspiration to us all. You have taught us that love must be taken care of with respect, care and forgiveness. This is to we love you. Happy 50th Anniversary! Mama, Papa your 50th wedding anniversary is giving me thousands of sweet memories that you provided me in my life. You both made my life full of happiness and blessings. Happy 50th Wedding Anniversary. My parents, you are my treasure and my ultimate love in this world. Without you, I wouldn’t have understood what true love is in the world?. I am feeling delighted at the moment of your 50th anniversary. Happy 50th Wedding Anniversary Wishes Mom and Dad! Most people find it hard to believe in “forever”, but seeing the never ending love between both of you makes me believe in “forever”. Happy anniversary mom and dad! Looking at you has taught me that true love does exist. Your unity brings happiness to my heart and a sense of pride for having you as my parents. Happy 50th Anniversary mom and Dad! 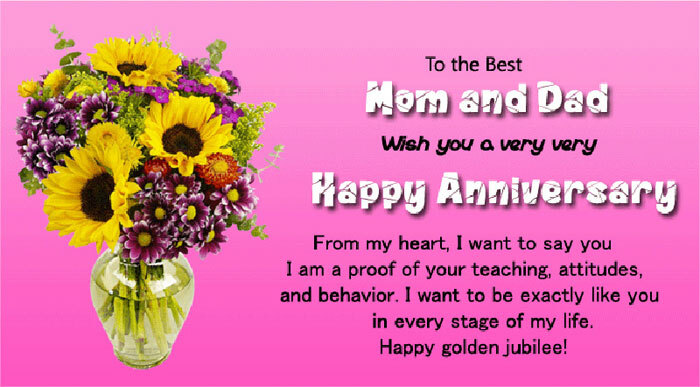 Parents are the role ideal for their kids, and I feel proud to be your boy. No matter how old I am but I always want to follow you and seek valuable pieces of advice from you. Happy 50th anniversary! Dear Mom and Dad, you are the founder of the most beautiful family. I always want to you thank you for giving me such a wonderful relations and everything which I desired. Happy 50th anniversary to you. Mom and Dad, I cannot begin to describe how blessed I am to have amazing parents in my life. Seeing true love through you both makes my heart happy. As your daughter/son I see perfection in both of you. I love you. Happy 50th anniversary to dear uncle and aunt you are just amazing with your love and integrity. I believe your love in future also remains the same either it’s increases. My darling Uncle and Aunt, You are a couple that truly rocks stay the same always. Happy 50th Anniversary. Best wishes to uncle and aunty, love between you will be forever and countless. You are the wonderful couple on this planet. Happy Anniversary! If there was one wish I could make so that it comes true I would ask God to send me in each birth wonderful uncle and aunt like you, Happy Anniversary. Your being these really counts you live in my heart wish you a Happy Anniversary you are our wonderful family part. This is a special moment today you successfully achieve the 50 years of your love and joy. This blessing of God may be with you till your last breaths. Happy 50th Anniversary! Joy, health and lot of love blessings showered night and day these are my well wishes to my dear Uncle and Aunt, I am sending them your way. To dear uncle and aunt a couple that loves and understand may your anniversary be Happy and Grand. Have a lovely Day and life! Best wishes to uncle and aunty on this beautiful day, I believe that the love insides is greater than the air which is present in the universe. You are the inspiring personality for me and others as well. Happy 50th Marriage Anniversary! With a promise of love, you became husband and wife. Your anniversary is gold, such a wonderful life. May you have fifty more, to love and adore. Happy Golden Anniversary! Love the way how caring you are, And it just with your care for each other, you have come so far!!! Happy Golden Wedding Anniversary Mom and Dad!!! I’d like to congratulate both of you on your 50th wedding anniversary. May God bless you and fill your life with more love and happiness. Happy golden wedding anniversary! On this golden Anniversary, I want to say I love you. You are essentially my life because without you I don’t think I would go another hour. Fifty years of marriage with your tenderness is the best gift God has ever given me. Happy 50th Anniversary. You two are a beacon of inspiration for many of us; your respect and love for each other is greatly admired. Enjoy another year together and hope you enjoy many more together. Happy 50th Anniversary. It is not easy to believe that you have spent 50 years together. You have spent all seasons together with great love and rest. Happy 50th anniversary to my sweet lovely couple. It looks like married life agrees with you and I wish the best for both of you! It’s not a matter of jokes to stay together 50 years. Happy wedding anniversary! A lovely daughter, a wonderful son, a beautiful house, two enviable careers and an awesome family – life seems to have given you both the perfect anniversary gift. Happy 50th anniversary. A relation so old only gets better with age, Where you can write beautiful songs on every page!!! Happy wedding anniversary! To celebrate your golden wedding anniversary we will send you many greetings and wish you many more years together in harmony. You fall in love with each other, every time, May the milestones of your relation you climb!!! Happy wedding anniversary! Your first wedding anniversary must have been really romantic. Your second anniversary must have been really beautiful. But this anniversary will be special because it’s called golden jubilee, have a glorious celebration! 50 golden years of your life, You have lived with each other and helped in each other’s strife!! Happy wedding anniversary!! May the melody of your anniversary be played by Xylophone, But still it won’t be sweeter than, for each other is your tone!!!! Happy wedding anniversary! 50 Years, 18,250 days, 438,000 hours, 4 hours, 3 towns, 5 children, 15 grandchildren, 3 great grandchildren, Time changes, yet I love you now as loved you then 50 years ago. 50 years ago two people got hooked, And today a golden recipe they have cooked! Happy wedding anniversary!!! The first 50 years of marriage are always the most difficult. It’s smooth sailing from here! Hope your next 50 years is even more joyful and exciting than your first 50 years. Happy anniversary!